English actor Olaf Pooley, who was born on March 13, 1914, passed away on July 14th at the grand old age of 101. Pooley’s best-known role was undoubtedly his 1970 appearance in the Doctor Who serial “Inferno” which starred Jon Pertwee as the Third Doctor. At the time of his death Pooley was the oldest still-living actor to have appeared on Doctor Who. In the seven-episode “Inferno” Pooley portrayed the monomaniacal Professor Stahlman, a scientist obsessed with drilling through the Earth’s crust in his quest to locate a new source of energy. As the story unfolds, Stahlman’s project instead unearths a green mutagenic slime that regressed humans into savage animals, and the drilling threatens to wipe out all life on the planet. 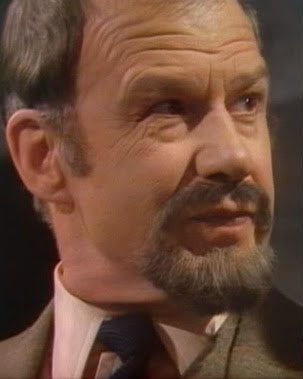 Doctor Who: The Book of Lists succinctly describes Stahlman as “arrogant, confrontational and pretty single-minded even before he gets turned into a hairy monster.” Indeed, Pooley played the Professor as a thoroughly-unpleasant individual, a villain viewers absolutely love to hate. Pooley was so convincing in this performance that whenever I saw him in other roles or being interviewed I was always a bit taken aback at how affable he actually was! It has been reported that Pooley was less-than-enamored with his heavy make-up in the later episodes of “Inferno.” One would think that most guest actors working on Doctor Who would be going in knowing that there was an above-average chance that they would end up playing some sort of grotesque monster. Having said that, I don’t blame Pooley for being apprehensive about being made up to look like something across between an ape and a werewolf! With its journey sideways into a parallel universe where Britain is a fascist police state and its ominous end-of-the-world scenario, “Inferno” is a favorite among Doctor Who fans including myself. It’s been included on several Top Ten and Top Twenty Stories lists over the years. Of course, Doctor Who was but one entry on Pooley’s resume. In a lengthy career that spanned from the 1940s to the beginning of the 21st Century, he worked in theater, television and movies on both sides of the Atlantic. In an interview conducted just last month Pooley related working alongside such noted actors as Michael Gough, Noel Coward and a young Anthony Hopkins. He also wrote several plays and screenplays. Moving to the United States in the 1980s, Pooley made a number of appearances on American television. Notably, he was a scientist in the 1985 pilot episode of MacGuyver, and he made guest appearances on popular series Scarecrow and Mrs. King, Hill Street Blues, L.A. Law and Dr. Quinn Medicine Woman. At the age of 86, one of Pooley’s last roles before retirement was in the Star Trek: Voyager episode “Blink of an Eye” which aired in January 2000. This made him one of only a handful of actors to have appeared in both Doctor Who and the Star Trek franchise. Pooley had a lifelong love of art. He studied at the Architectural Academy in Bedford Square. It was after being convinced that it would be difficult making a living as an artist that Pooley went into acting. Yes, his second choice for a career was one that had only slightly better prospects for financial security! Pooley really must have been a creative person with a passion for expressing himself to have gone that route. Fortunately this worked out quite well for him. In his last years Pooley was still involved in the art world. Having retired from acting and living in Los Angeles, he once again immersed himself in painting, spending the final decade and a half of his life creating many pieces in his Santa Monica studio. I find it amazing and wonderful that Pooley was active right until the end of his life. Imagine retiring from a job that you enjoyed and then spending your remaining years actively engaged in a hobby that is a deep passion for you. On top of that, to live to be over a century old and still be in fairly good health & retain your mental faculties? We should all be so lucky! That’s a happy entry into the “Who knew? !” column.